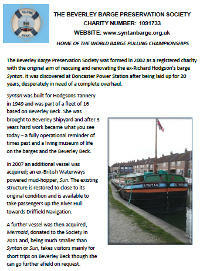 Download the Beverley Barge Preservation Society brochure (950kB pdf). Welcome to the Beverley Barge Preservation Society, a registered charity set up in 2000 to provide visitors with a memorable experience. We own the MV Syntan, an ex-working barge previously operated by Richard Hodgson’s Tannery to carry hides and other tanning materials from Hull docks to the Beverley Beck, and then by road to the Tannery which was situated in Flemingate. Syntan now acts as a museum, heritage centre and community resource for meetings, parties and so on. There are two other boats owned by the Society; Sun a former British Waterways maintenance vessel (52' x 13') and Mermaid a 30' x 91/2' ex-lifeboat. Sun takes parties of up to 12 on the River Hull towards Driffield Navigation, while Mermaid is available for booking for groups of up to 8 for trips along the Beck and upriver. 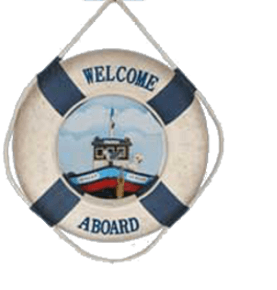 For more information on the Society, to book trips, and request details on using Syntan as a venue for meetings, school trips, parties and so on please email us: info@syntanbarge.org.uk. 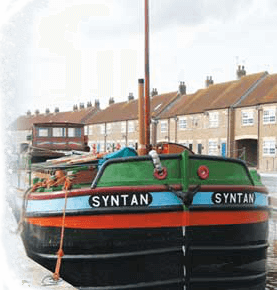 The barge Syntan is 70 years old this year and to celebrate the fact we invite you down to Beverley Beck to join in the festivities on Saturday and Sunday 13th and 14th April 2019. The Beck will be lined with boats including the sailing barges that used to ply our waterways. Music, food, drink and general entertainment will also be available. There is no charge for this event, simply the rare opportunity to see so many ex-working boats on the Beck all at the same time.